This one is done, except for a hole in the end facing us. I need another one like this, though. 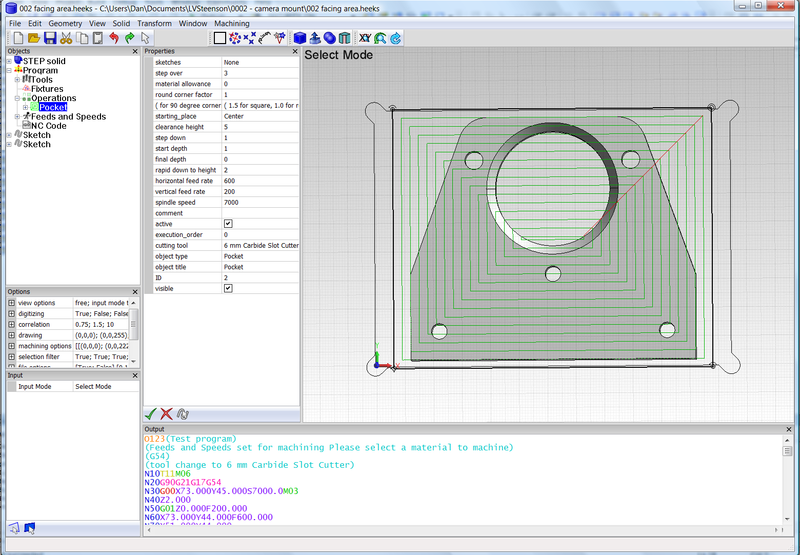 This part will require machining in two different setups. First I machined some counter-bored holes in a piece of wood ( using the Profile operation ) and finished them with Dad's pillar drill. I bolted this on to the table using the t-slots. I machined an area flat on the wood. I super-glued the Delrin to the wood. I am doing some profile operations with 6mm slot cutter. 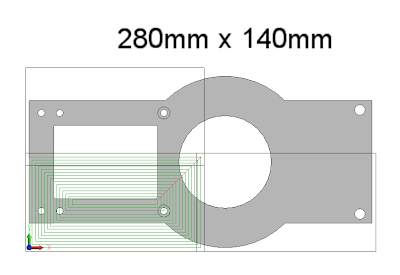 Unfortunately I forgot to check that the Y-axis had enough travel in the position I placed it. It hit the limit while rapiding to the outside profile. The part is not scrap. I will need to do it again, but machine an area in the wood with an island left standing in the middle to locate the part. I extended the properties window to be able to have a different window. This can be in addition to or instead of the property grid. 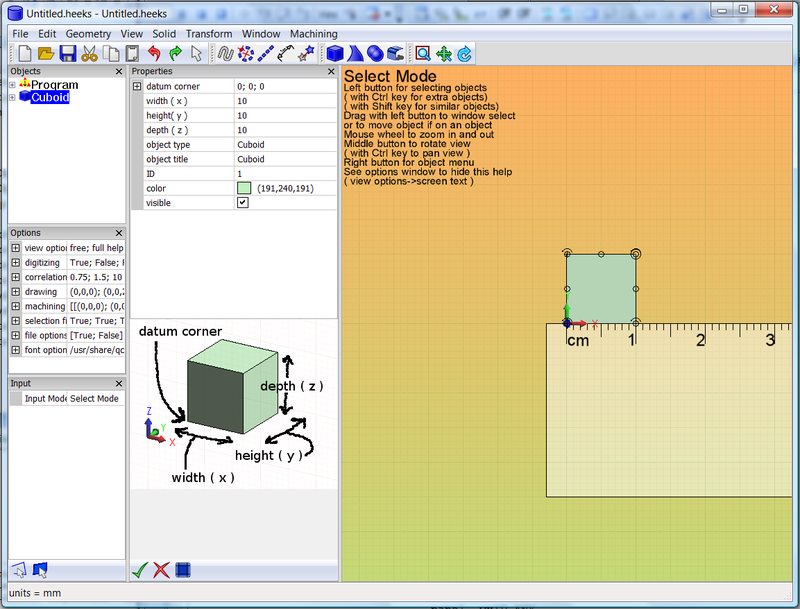 My example for cuboid just makes a window with a picture, but I hope to make some windows with controls ( edits, radio buttons, pictures, list boxes ). This works well. It is a bit labourious having to saw away all the wood, so it is flexible enough to peel off the Delrin, but worth it. 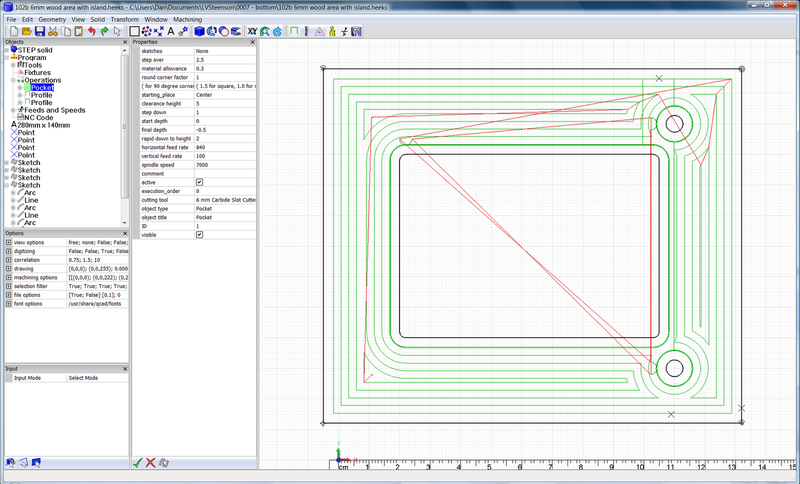 Leaving 0.1mm on the depth is always a good idea. It doesn't take long to sand it to exactly the depth I want. I think carpet tape would be too inaccurate. Also I don't have any. No. But I can sand it off and nobody needs to know it was there. 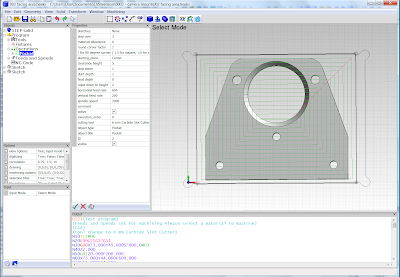 I'll leave a little bit extra on the face machining depth, so I can sand it down to the required thickness anyway. A daring attempt to not waste material. I wanted to do this one without needing tags. It seems to go wrong on the above picture, where the two clamps can't stop the top edge lifting up a bit. The underneath of the arch seems to join perfectly, so the lifting edge went back to where it was when I moved the clamps. I might try clampless machining. If super glue works well enough, it might be worth clamping the Delring to the wood with super glue. I made 2 more of these yesterday afternoon and I made 3 more of them this morning, so that is the 6 required. With my method of clamping on to a sacrificial piece of hardwood, there are inaccuracies in thickness of the parts. If I clamp tighter, I get a thicker piece. Most of these pieces are between 9.96mm and 10.02 at the edges and about 9.85 to 9.95 near the middle ( depending which part you measure ), because of the way the piece is bending when clamped. But one part is about 9.88 all over, where I didn't clamp it so hard ( to try to reduce bending ). I could improve this, by using some aluminium to act as the sub-table, but this would make everything more expensive. I think these are meant to be fairly low cost parts. 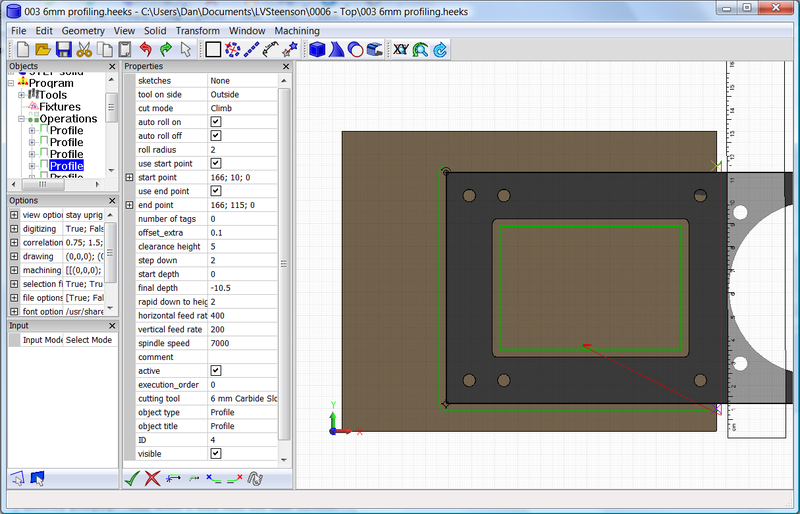 I will try clamping more gently for the facing operation, but adding 0.1mm to the programmed depth. I made Part 0004 correct, first time. There are 6 in total wanted of these. 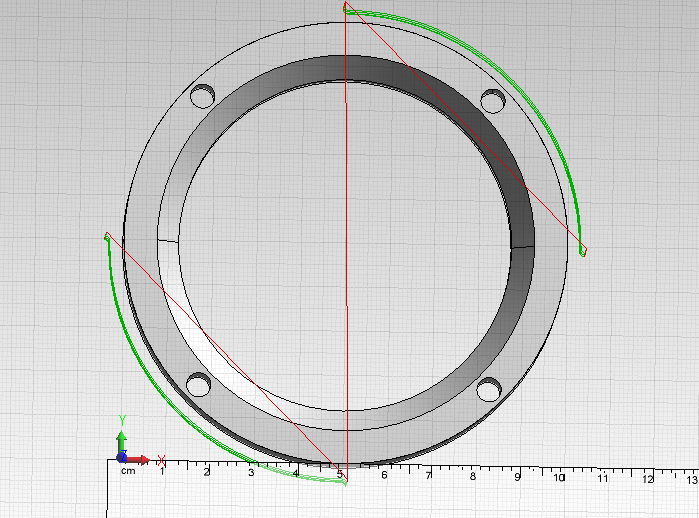 I got the chamfer to within 0.1mm of what I wanted, I think; it's hard to measure the chamfer. The subsequent copies should be more relaxing to make. There are no tags on this part. I cut the outside profile in two separate operations, so I could remove two of my four clamps and replace them to get to every part of the profile. I put my fingers on the part as it was being cut to catch the piece of scrap that falls off and to damp vibrations. I made Part 0003 correct, first time. I was able to re-use some of the operations from Part 0002. This video shows the rough profile pass for the outside shape, done in two steps of 5mm. I did Part 0002 again with no mistakes. The chamfer is about 0.2mm under size. I don't think this will be a problem. Only one mistake, this time. The chamfer was too big. I worked out what I did wrong. 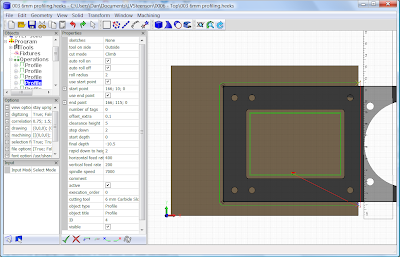 I wanted to offset the path 1mm from the part, so I told the software it was using a 1mm slot drill. I should have told it it was a 2mm slot drill. The chamfer is 3.8mm instead of 3mm. 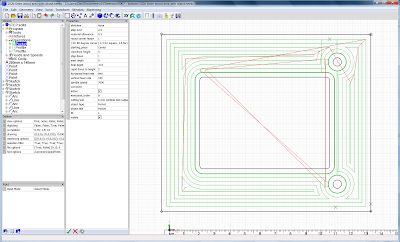 I left on 0.2mm for safety, but it was not enough. 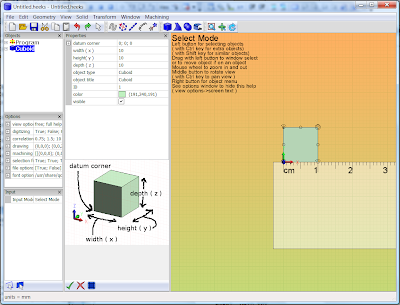 I am making another part using HeeksCNC 0.13.0 and my Sieg KX1. I made several mistakes and the part is scrap, but I didn't break any tools. Mistake 1: The clamps were not far enough from the toolpath. I loosened one clamp and moved it and retightened it during cutting. This let the part lift up a little and I cut too deep. I should have pressed STOP, then moved the clamp, then restarted the operation. 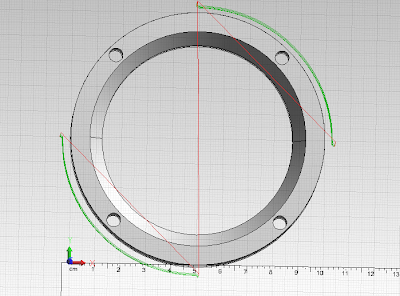 Mistake 2: I zeroed the Z of the chamfer tool assuming it comes to a sharp point, but it has a small flat. So the chamfer was cut too big. Mistake 3: I saw 5 holes and assumed they were all the same size, but some of them were smaller. I will try again with no mistakes.